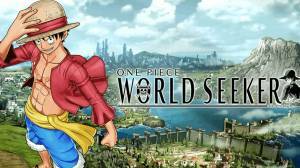 One Piece World Seeker is an open world action-adventure game based on the manga and anime series One Piece. You play the role of Monkey D. Luffy, also known as 'Straw Hat Luffy', the founder and captain of the Straw Hat Pirates who is searching for the titular One Piece treasure, that will allow him to become the pirate king. In One Piece World seeker Luffy is separated from his crew on the conveniently constrained Prison Island, which is in a constant state of unrest thanks to the occupying military forces and put-upon locals. One Piece: World Seeker is a big open world with areas that you will not be able to access straight away. Even so there is still a lot to see and do when you begin the game, you will discover when you start exploring that what appears to be empty areas will often contain enemies to kill and loot to find. The glowing spots you see dotted around the map indicate the location of hidden treasure. As you explore the world you will also find wooden crates that will contain items and materials and chests in hard to reach areas that are filled with loot that includes blueprints to make clothes. Check out our How to Change Clothes page to find out how to craft clothes from the blueprints you find in chests. Early in the game you may want to consider buying the Gum Gum UFO skill with the Skill Points you earn. This skill makes collecting items that have been placed in awkward areas a lot easier to reach as it enables Luffy to spin through the air following a jump so he can travel further and higher. The Gum Gum UFO skill is cheap, only costing 100 Skill Points and can be found in the 'Explore' section of the skill tree. The Fast Travel skill is unlocked early in the game and will allow you to jump to certain points of the map almost instantaneously. There is no limit for using it and you will not be penalised in any way so make sure you take advantage of it as soon as you have it. The points that you can use Fast Travel to get to will usually be centers of towns and cities on the map, they will however only be available for Fast Travel if you have already visited the area. Don't forget to use Luffy's grappling ability to pick up hard to reach items and traverse environments easier. Luffy has the ability to use his stretchy long arms to reach high up ledges and even catapult across distances by reaching a wall far in the distance. Luffy's grappling ability becomes possible when there is a surface that he is able to grapple towards. A marker will appear on the screen indicating that the move is possible and it is performed by pressing the right shoulder button on your controller. Check out our How to Grapple page to find out more about Luffy's special ability. Once you have played the game for a couple of hours the tutorial will introduce you to the crafting system which will enable you to craft useful pieces of equipment using the materials you come across that will improve and boost Luffy's skills. To be able to craft you need to find recipes. Once you have obtained a recipe visit Franky on Luffy's ship (Thousand Sunny) to see if it's worth collecting the required materials by doing certain missions to craft it. Luffy can't swim and will sink if he enters water. Although it is not game over when this happens he will fade to black for several seconds before being returned to where he was before he decided to take an impromptu swim. Whenever Luffy finds himself in combat you should look to mix up his attacks to find out which work best against certain enemies. You can change between Luffy's fighting styles by pressing 'Down' on the d-pad and you can perform his special attacks by pressing the right shoulder button, and use the left stick to select the attack. New special attacks will become unlocked as you play. No discussions open for One Piece World Seeker at the moment.